Have you been dreaming about an ultra-wide curved gaming monitor with a picture quality as good as 4K? Well, you don’t need to dream anymore. The Acer Predator X34 curved ultra-wide monitor is here, and it’s a really sweet deal. You’ll see PC gaming in a whole new light once you get your hands and eyes on this monitor. This monitor uses In-Plane Switching (IPS) panel with 21:9 aspect ratio. The panel uses LED backlight and anti-glare screen coating. The native resolution is 3440 x 1440 with 60Hz refresh rate (overclockable to 100Hz). The Predator only has one DisplayPort and one HDMI 1.4 inputs. Five USB 3.0 ports (one upstream and four downstream) are also available for connecting various peripherals. With 4ms of response time, this monitor is more than ready for your favorite action and fast-paced games. Two 7-Watts speakers and one headphone jack are available for those without dedicated sound system. Gamers who prefer wall mounting will be pleased to know that this monitor is VESA compliant. A 100 x 100 mm flat panel mount interface is available at the back of the monitor. Acer keeps the design clean and nondescript for the most part. Don’t get it the wrong way; this monitor still looks very sleek. The top and side bezels are thin in matte black color. The bottom bezel is no more than an inch thick with the Predator logo and inscription prominently placed. To spice things up, Acer puts a series of LED under the monitor to give you adjustable ambient lighting. Available colors are red, green, blue, white, and orange. You can set the glow to static, pulsate, or ripple. If you choose MNT on the ambient lighting option, the LED will turn red when G-Sync is on. 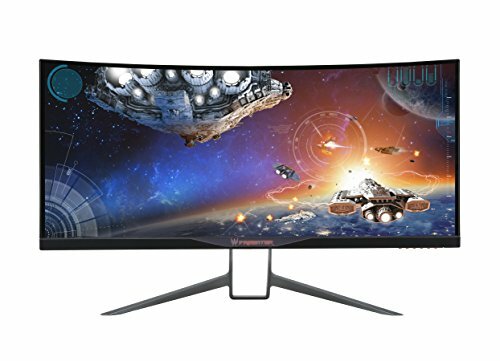 Since this monitor is marketed as a curved gaming monitor, some people are quite disappointed when they find out the curve is subtle. They’re in the wrong, though. A monitor doesn’t need a conspicuous curve to be great. The X34 has a 3800R curvature, which means if you line the monitors edge to edge, they will make a circle 3800 mm in diameter. With a 34-inch screen, such curvature is enough to fill your peripheral vision with stunning visuals. Truthfully, the real estate offered by the X34 is nothing short of amazing. It beats having three 25-inches monitor setup by miles. The back portion of the X34 has nothing fancy that’s worth mentioning. It’s all simple with glossy plastic end to end. All the ports are tucked away on the rear without any plastic housing to cover them up. You have one DisplayPort 1.2, one HDMI 1.4, five USB ports (one upstream, four downstream), and one audio port. If anything worth mentioning, then it’s probably the two small speakers. Being small and rear-facing, they are hardly sufficient for a decent gaming experience. Yes, it’s DTS audio, but two small speakers are nowhere near enough to take full advantage of it. You’ll get better audio experience by plugging in your headphones into the audio port. Now, let’s talk about the stand. At first glance, the stand may look flimsy, but it is made of heavy-duty aluminum and provides excellent support for the 21.9 pounds monitor. Everything is metal with no bulky plastic housing of some sort to cover it up. The top part of the stand features a handle to help you lug around the monitor when needed. We should warn you that the feet of the base extend far to the front, both right and left. You may end up needing a smaller mouse pad, or else the feet will stand right on top of it. The stand allows height and tilt adjustment. You can raise or lower the monitor about 5.1 inches and tilt it from 5 to 35 degrees forward and back. Weirdly enough, there’s not swivel adjustment here. Perhaps Acer deems it is an adjustment that people rarely use. That’s not a big deal since you can rotate the display along with the stand easily. If you prefer wall-mounting, there’s a 100 mm VESA mount on the back. A sturdy metal adapter is already included, so whatever aftermarket bracket you use, the monitor can be mounted securely. The physical buttons to play with the settings are located at the bottom right. However, they’re too smooth and sometimes difficult to tell apart. If you have thick skin on your fingers, you just have to rely on your eyes to tell if you’re pressing the right button. You also have to press the button before you know what it does. Pressing one of the buttons under the monitor will bring up five icons: Game Mode, Overdrive, Volume, Input, and the main OSD. Acer’s basic setup is fine as it is, and most users will feel that it is satisfactory. The colors are excellent with only a small hint of oversaturation. Of course, there’s always room for improvement and personalization. One setting that you ought to modify is the contrast control. Turn it down to 44 to get the best detail without any clipped highlight. For overclocking the refresh rate to 100Hz, you go to the main OSD and pick Setting. Set Max Refresh to 100 and reboot. Here’s the catch: if your graphic card is not powerful enough, it may not be possible to hit 100Hz. Some gamers say their monitors are stuck on 90 or 95Hz before they upgrade their graphic cards. So, if you want that 100Hz goodness, you better be ready to invest in a more powerful graphic card. Acer could use a lesson or two from ASUS’s PG348Q when it comes to monitor setup. ASUS uses large and clicky buttons complemented by a small joystick which makes accessing every menu and submenus a snap. ASUS also makes the menus intuitive and easy to use. If you’ve never used an Acer monitor before, it may take a while before you can change the settings in this monitor without consulting the manual. Another gripe when setting up the monitor is the cables. Both the DisplayPort and USB cables are only 4-feet. You should buy 6-feet cables which will make cable management easier. The beautiful IPS panel used here can produce 100% of the sRGB color gamut which translates to 1.07 billion colors. There’s not a single color this monitor can’t produce. The whites are white, and the blacks are black instead of dark gray. Moreover, with 178 degrees of horizontal and vertical viewing angle, everything looks uniform from side to side, top to bottom. This is something that TN panels can never achieve. Beautiful color on a flat monitor screen is something, but beautiful color on a curved monitor is even better. Even though the curve is subtle, it helps to put everything in focus. With a flat panel, your eyes need to shift focus to see everything on the edges. With a curved panel, your eyes don’t need to shift their focus. Everything is in your field of view. Some gamers say that using an ultra-wide QHD curved monitor such as this one is like reinventing PC gaming altogether. They’re not hyping it up. You just have to see and feel it for yourself to believe it, but the immersion comes real close to 3D. If you’re worried about backlight bleed, don’t. While it is rampant in earlier versions of the X34, light bleed on the newer ones is abysmal, and you’ll only notice it when you’re looking hard for it. The 100Hz refresh rate on the X34 is something worthy of praise. For a while now, manufacturers have realized that many gamers are starting to want more than just 60Hz. Having a 60Hz panel is by no means lame, but today’s fast-paced games are getting more and more demanding. The X34’s native refresh rate is only 60Hz but overclocking can ramp it up to 100Hz. Now, having a 100Hz refresh rate is nice and all, but if your monitor is out of sync with the graphic card, you’ll end up with choppy images all over. This is where NVidia’s G-Sync comes into play. By syncing the frame output from the card and the refresh rate of the monitor, screen tearing is eliminated. NVidia G-Sync on 100Hz is no less than gorgeous. It makes games running smooth as silk. No screen-tearing even on the most demanding of games. Of course, you better upgrade your system too if you want to take this monitor up to its fullest capacity. A GTX 970 barely cuts it. A 980 will do fine, but you should go with a 1080 just to be on the safe side. Ghosting is barely noticeable when using OverDrive to crank the refresh rate to 100Hz. Response time remains excellent, and lag is kept in check. Earlier versions of the X34 has that annoying coil whine when you are constantly using the 100Hz refresh rate with G-Sync on. Newer batches fixed this, and you should not have any problem with it anymore. The downside of having NVidia G-Sync is that the monitor can only have two inputs; one DisplayPort one HDMI. Not really a problem if all you’re interested in is using this monitor for gaming. But if you already have a couple more systems to hook up, you may feel that it’s insufficient. Although gaming is what this monitor is made for, other tasks benefit from the ultra-wide form factor too. Those who do a lot of video and photo editing with multiple windows open at the same time will appreciate the extra real estate that 21:9 aspect ratio has to offer. This monitor has many settings you can tinker with. One notable feature is the blue light filter that will help reduce eye fatigue when you’re pulling a gaming marathon with your friends. There are five levels available, and you can pick the one that suits your need. Other settings are the Dark Boost and Adaptive Contrast. Dark Boost is useful when the game that you play has plenty of dark scenes. Three level settings allow you to adjust how much shadow details you want to see. With Adaptive Contrast on, the image will automatically get brighter or dimmer following the change of scene. Gamers are split about this one. Some love it because it prevents those overly bright cutscenes from blinding them, while others hate it because it’s such a nuisance. You should try it out for yourself and see if you like it or not. Another feature is a crosshair overlay that should help you aim better in First Person Shooter games. There are three different crosshair types that you can choose, and all works flawlessly with in-game interfaces. Seriously, whether you’re playing CS Go, Battle Field 4, or other FPS games, you no longer need to scope to get a good hit. Next on the list is the frame-rate counter. It shows in real time just how many frames per second your game is currently running at. Note that, the frame-rate counter and the crosshair overlay cannot be displayed at the same time. By the way, the ASUS ROG SWIFT PG348Q also has these two features. It also uses IPS panel with 21:9 aspect ratio and 100Hz maximum refresh rate. It’s no wonder that the X34 and PG348Q are often compared together. IPS panel gives excellent performance for games, photo editing, video editing, and much more. Built-in speakers are weak, but it’s way better than the competitors. The Acer Predator X34 goes head to head with the ASUS PG348Q. They’re in the same price bracket, have similar panel quality, and similar features. You can’t go wrong with either. ASUS does win in the ease of use, but not everyone fancies the futuristic design which some even tout as over the top. When you prefer a simpler design to go with the rest of your setup, the Acer Predator wins hands down. It’s simple yet sleek. It will blend nicely with any gaming setup you already have. All of this makes parting with your hard-earned money a little bit easier.